Our newest update on PC includes an in-game store for Warhammer 40,000: Inquisitor - Martyr, among other fixes. You will be able to spend your Fate points here, allowing to purchase certain DLCs. As of now, this is just the implementation of the feature, so you can't buy a lot of things, but in time, the stock will grow with several types of DLCs, such as Priority Assignments, Emotes, and more. Again, this does not require you to spend any real money, as Fate can be farmed by pretty much just by playing the game, completing missions, especially Ordos Directives, selling high-tier items, gaining System Influence. Also, being on Weekly Glory charts is a good way to earn them. 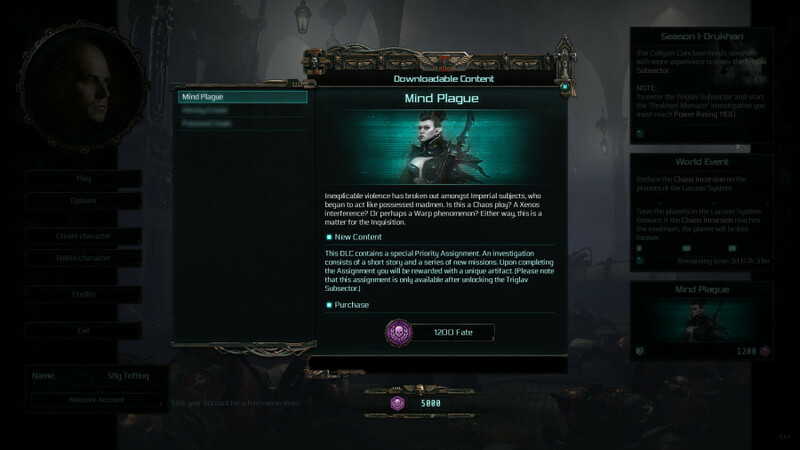 Our first DLC is a Priority Assignment called Mind Plague. Available after unlocking the Triglav Subsector, this Assignment consist of a short story and a series of new missions. Upon completing the Assignment you will be rewarded with a unique cosmetic item. We also took this opportunity to include a few more fixes, read here for the full patch log! The 1.2.1 update on Steam is available after a brief maintenance, which starts at 4pm CEST. We hope you like the new update, let us know in the comments! Hi! I really like that you can buy the DLC:s with in game currency. I have an old bank card. My question: Does the DLC:s come to the PS4? I really like Martyr so far. Great game! Please note that the Outpost DLC is not contained in the Season pass because it was initially a pre-order bonus. Please contact Microsoft's support since only they can assist you in the matter related to their store! Any tips how to get that new dlc?Have season pass and i cant find any new content.Microsoft store its not working at the moment so dont now how to check that. I thought a few Weeks ago as i saw how much Points you have to earn and spend for some Missions in the Endgame that i woudlnt be surprised if there come real Money Purchases,cause the amount you need ,(500 for Nemesis?) seems pretty High. I mean the Green Endgame currency. I hope there comes no Real Money Store Stuff into this Game,cause it seems to be made for this,atleast with some thoughts about it in Mind. To always see Ads to Purchase stuff etc would break the Game for me,and i already payed 100 Euros for a Game that was really Rough at release. I already felt a bit F* as i saw that theres a new Mission for about 5 Euros and the Servitor that isnt included in this Heavily Expensive Edition. Was the First and last Time i bought such an Edition thing. I like the Game how it is,i even dig the huge Grinding you have to do on always the same Maps cause Fighting is fun in the Game. But im on the Border to feel robbed. To me its a really good Hack'n Slay and the best Alternate to Diablo 2 aside of Path of Exile,i just hope the Direction doesnt get influenced by 2 much greed and more by Heart. The Charybdis Outpost mission is the only DLC not contained in the Season pass since it was meant as a pre-order bonus who ordered the game before the launch of the game on console. Yeah, not on PS 4 currently. And whats up with the Charybdis outpost mission? I bought a Season Pass but the PS 4 Store indicates that i have to bay about 5 EUR for it. Is this real, or do i only have to wait? If i have to pay, than what was the Season Pass for? Is this on PS4 also? how do you access the Charybdis outpost mission? just bought on the xbox store installed no problem just cant find it. no prompts no nothing. Don´t play it on Xbox, but my guess is you need to go where you go when you choose specific or random assignments side Missions. Well, the Mind Plague DLC. Either you grind till you drop and get it that way with Fate pts. Or you quite simply just skip that bottle of soda you were thinking of getting in the grocery store and spend it on a few extra Missions you can play here instead, for a cpl of hours. It doesn´t add anything new which you haven´t seen already. But you do get a nice cool helmet you can wear when you´re done with the Missions. And besides, I´m not gonna bother complaining either. I had fun whacking some extra Dark Eldar. If I had to pay $10 for the exact same content, I would actually complain. A lot at that too. I'm a big fan of letting the player to choose in-game currency or real money, nice one - at least this gives a choice of grind or pay. If anyone knows though - I'd like to know how this effects the season pass (if there is going to be a pc one) or a one off. due to the regional differences there were some delay in the deploying of the newest patch for Xbox. As we checked it works now in every region properly. We are sorry for the inconvenience this issue caused! I really wouldn’t mind if the Season One content were delayed if it meant less bug fixes, Just get the current fix out there so we can play what we already have, this is current hiccup is not giving me a warm fuzzy about my purchase! I get the sinking feeling that this update does not include the Season One event content that was promised in the roadmap for Sept. They moved it to October on the roadmap. Thx a lot for all of this work!